From the days when you had to download an autojump script alongside the game. As most folks know, the rocket jump was an accidental invention. It was never intended it to be part of Quake, but after players started using it, it became impossible to imagine the game without it. But everyone knows about rocket jumping. So instead, let's highlight a similar mechanic from the less successful, but incredibly awesome, Starsiege: Tribes. Tribes was a weird game, being essentially a pack-in bonus shooter with the almost completely forgotten mech-game Starsiege, in which two teams fought with the '90s most awesome mode of transportation—jetpacks. It was a game of incredible scale, with precision targeting required to land a kill, and a central base-assault mechanic that still stood out a few years ago when the series returned as Tribes: Ascend. Tribes had rocket jumping, but its real secret was skiing—abusing the physics engine to zoom down hills while jumping and so cross the map at incredible speed. At the time, it was so fast that you could practically feel the wind in your hair as you did so, especially if you set up a small desk fan on top of your stupidly huge CRT monitor. The experience of bombing across a map, spinfusor flying, and taking an enemy base before they could even get started gave Tribes an edge that nothing else at the time could get close to. And after that—jetpacks were still cool! 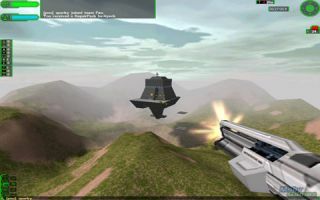 Later games didn't simply keep this tactic, but built it in deeper, with Tribes 2 maps designed around this ability and the series even offering tutorials on how to pull it off. After a while, if you weren't skiing, you weren't surviving. Learning to shoot on the move… that took more practice. But still, there’s little as satisfying as cresting a hill and nailing that enemy's head. Shazbot!